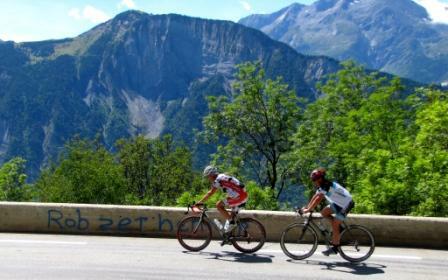 Stage 19 started in the town of Modane; climbed over the Col du Télégraphe, the Col du Galibier (again, but from the other side of the mountain) and finished with the infamous climb up to the alpine village of Alpe d’Huez. The day’s ride would represent a total of 110km with a vertical gain of 3155M (10,351ft). After the great ride from the previous day, I was excited to ride the same route that Gerry rode about a month earlier in the 2011 Etape du Tour, where 10,000 cyclists took part. After the good luck hug from my daughter Nicole, I was on the road again. It took a few kilometres to get my legs loosened up after the previous day’s effort, but once I got going, everything felt as it should. I was really looking forward to a fast ride to the base of the Col du Télégraphe, but it was not meant to be as the previous day’s head wind returned and instead of flying down the hill from Modane to St-Michel-de-Maurienne at 60 km/hr, I was grunting along at only 34km/hr to 40km/hr. Once I got into the shelter of St-Michel-de-Maurienne, the pace picked up, but it too was short lived, as I made the sharp left hand turn over the little bridge and the climbing began. I thought I was in the middle of a race, as the hill was full of cyclists. Some have said I’m a little competitive, I don’t know where people get this idea from, but with that many people to pass, I shifted into race mode and started picking cyclists off one by one. I was particularly impressed by the advanced ages of many of the riders on the hill. It speaks to the difference in importance the French on their personal health and wellness. As I passed this one particular French guy, it was clear he wasn’t just going to lay down and let me roll on by, so he hopped on my wheel….and so the race was on. After pushing each other for a few kilometers to see who the stronger rider was, we realized we were equally matched and were heading to the same destination. I also found the only Frenchman whose English was as bad as my French, but after a while I found out his name was Herve. He thought it was amusing that my last name was “Armstrong” and I was a cyclist. We communicated only using the few nouns we knew and no verbs to string any kind of sentence structure. After a short time at the top of the Télégraphe for a few photos we offered to carry Herve’s back pack since he head to Alpe d’Huez too. 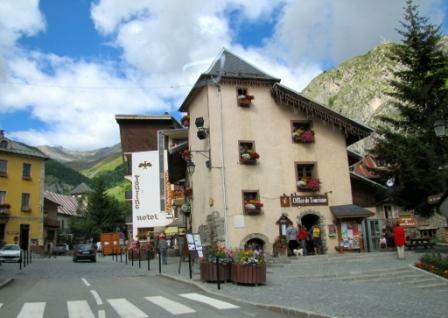 We exchanged some more nouns, because that was the extent of our language skill and before you can say derailleur (a word we both understood) we were descending into the town of Valloire. 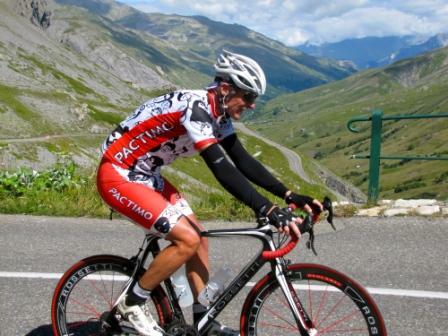 It wasn’t until we approached the base of the Galibier that he realized Nicole was actually my daughter and not my wife. He kept referring to her as my “woman” and I replied “Yes, my Daughter”, he nodded his head in agreement although he didn’t understand what the word “Daughter” meant. I think he was confused that I had such a young wife, so he tried to ask how old I was and it was only when he said, “me four two” that I realized he was telling me, he was 42 years old. I responded, “Je suis cinq cinq”. His reaction to my 55 years of age was priceless. He immediately said with excitement, “your woman is child”. Glad we got that cleared up, because up until now, he either thought I was a dirty old man, or a lucky old guy. Gerry told me that the Galibier really doesn’t get hard until you reach the small bridge where you make a sharp right hand turn. He wasn’t kidding. As soon as you cross the bridge the road goes vertical and rarely goes below 9% to the top. Herve and I rode our own pace picking off riders on the way up. I was a little faster, so I put some distance between the two of us but I kept looking back as it would be more enjoyable riding with someone to Alpe d’Heuz, even if we couldn’t communicate that well. 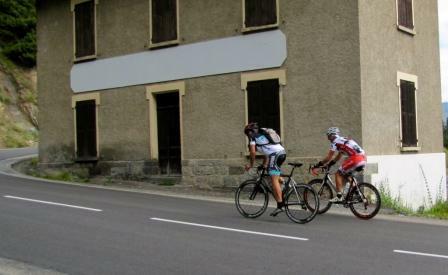 As I was looking back with about 7km to go, I noticed a rider that was gaining on us. You can imagine my surprise when I was about to be passed by a young girl approximately 20 years of age. 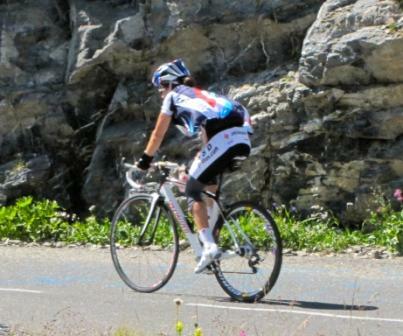 I thought to myself, I can’t just let her ride past me without a challenge, so I matched her pace for about 300 meters and finally said to myself, she’s probably not riding all the way to Alpe d’Huez like Herve and I, so I should let her go…..or at least that’s how I justified being caught and passed by a young girl. After swallowing my pride I continued to focus on hard tempo riding while enjoying the stunning beauty of my surroundings. And not everyone takes cycling as serious as me! Once at the top, it was time for more mandatory pictures to prove we actually rode to the top (again), put on our jackets and started descending the road that I climbed the previous day. What’s with French guys? It seems they can all descend hills like the wind. This time, I wasn’t going to let someone ride away from me on the descent, like the guy did the previous day on the d’Izoard, so I kept Herve in my sights all the way down. The other thing we North American’s aren’t that used to are the extremely narrow, steep, technical roads with no guard rails. 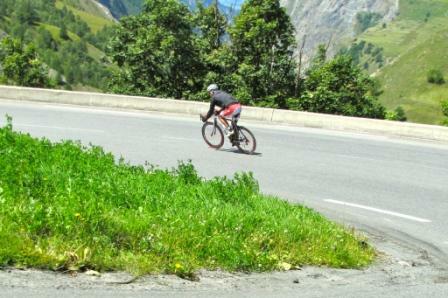 So I was a little uneasy as we approached 80+km/hr on some of the steep downhill stretches off the Galibier. Just like the previous day, the summit of the Galibier was very cold and the descent was even colder due to the wind chill. It wasn’t until we reached the town of le Grave before I began to warm up. I also didn’t realize how much energy I expended trying to stay warm on the long descent towards Bourg d’Oisans and it would come back to haunt me in the final kilometers of the Alpe d’Huez climb. The ride to the base of Alpe d’Huez was not as technical as the ride off the top of the Galibier, so we could really ride fast through the sweeping turns surrounded by beautiful scenery. Herve and I switched off taking pulls on the front to keep our speed high. What a rush! 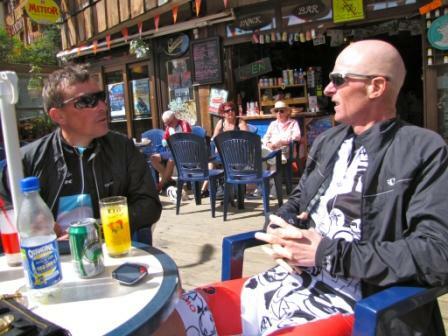 Herve had ridden Alpe d’Huez a number of times before, so he knew what to expect, as where I had no idea. In a word this climb is “RELENTLESS”. The climb has 21 switchbacks and the incline actually drops slightly at every switchback, so you actually get a little break when you make the corners. By the time we made it to the climb the sun was out in full force and there were 100’s of people on the hill. Everything was going to plan and I was feeling great as we maintained a steady pace up the hill. At least that was until about 4 km’s to go, because with little warning I bonked like I’ve never bonked before. 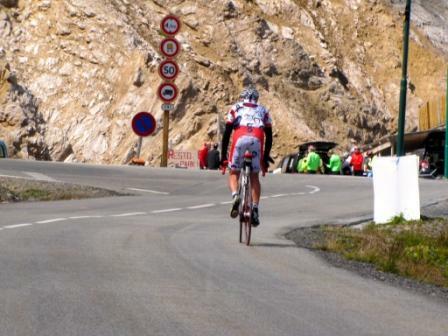 I could only think it was because I underestimated the energy I used trying to stay warm coming down the Galibier. I went from riding a strong steady pace, to a slow death march. I kept saying to myself, “pain is temporary, but quitting lasts a lifetime”. After a slow and painful 4kms, we finally reached the top and it couldn’t have come fast enough. I recognized the road through the small alpine village from the Tour on TV and sure was happy when I made the final left hand turn to the finish. Made it! Herve, Nicole and I stopped at a little bar to re-hydrate and purchase the Alpe d’Huez souvenir jersey that I’d wear on my next club ride at home. You know…bragging rights. After purchasing our jerseys and saying goodbye to our new friend, Herve, we headed off to Provence. For the most part, our GPS was very reliable, but we did get a little disoriented when it directed us onto a country dirt path and proceeded to tell us to make a sharp left turn into a river. 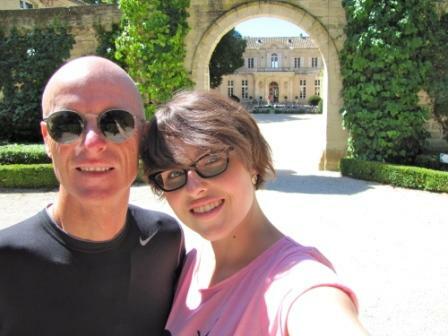 After having to navigate old school using a map, we were back on the road and we arrived at our destination in the heart of Provence for the next week at Château Du Martinet near the town of Carpentras. The Chateau has a great history having only had three owners since the land was acquired in the 10th century by a wealthy Italian family. The Chateau was built in the 13th century, burned during the French Revolution, rebuilt in the 17th century. It was sold 15 years ago by the original Italian family and sold once again five years ago to its current owner. It’s remarkable that over a span of 1100 years, it’s been owned by only three families. It was a real treat to coming back every day from a ride and enjoy such a beautiful peaceful environment. 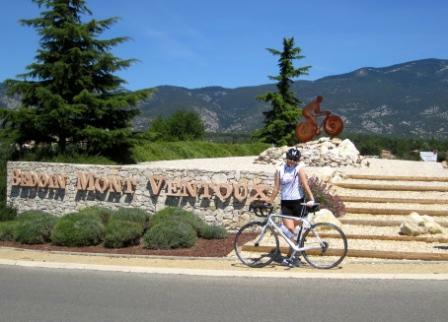 We rented Nicole a bike from a little shop called La Route du Ventoux in Bédoin . It’s located right beside the mile zero sign at the base of the road that leads to Mt Ventoux. Nicole’s longest ride up until our first day was 50km. 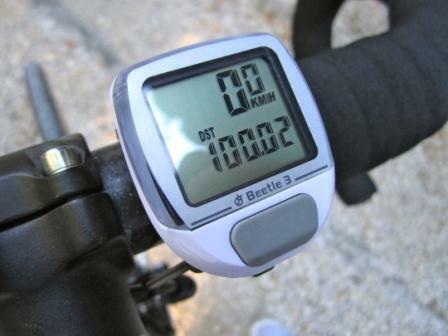 We rode through the Gorge de la Nesque and due to a “little” miscalculation on my part her first ride in Provence was 100.2km. Not bad for the first day of real riding. We rode alternating hard/easy days. 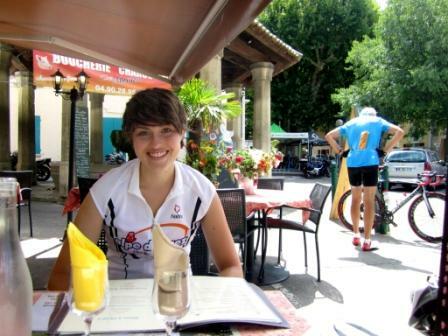 On the easy days we would go sight-seeing around Provence during the afternoon after a short 40km-50km morning ride and then enjoy dinner at one of the 100’s of outstanding restaurants in the region. Provence is absolutely beautiful and I could have easily spent a month there (ok, let’s be honest, I could live there). The roads are great and the motorist (unlike North American’s), respect cyclists and the cycling culture. During the entire time I was in France, I didn’t have a single driver hook their horn, cut me off, or drive dangerously close. Truly this is cycling heaven. The following picture represents the very essence of the region. My daughter and I are at a little café in the town of Malaucène (one of the three towns at the base of Mt Ventoux) and this older French fellow in his cycling kit is admiring my bike. 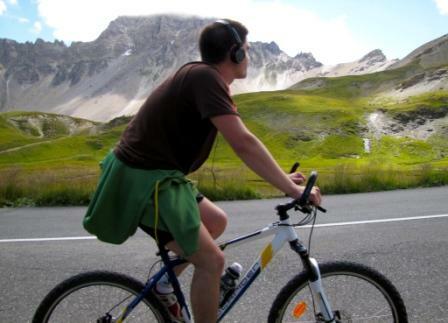 The best part of the picture is he has a partially eaten baguette in the middle pocket of his cycling jersey. How’s that for French? 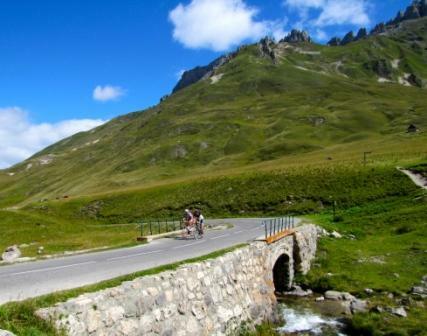 This entry was posted in Cycling, Guest Bloggers, Mythic Rides / Climbs and tagged alpe d'huez, col du telegraphe, galibier. Bookmark the permalink. Another really interesting post, thanks Rob. Glad to hear you’ve you’ve had good experiences with motorists. 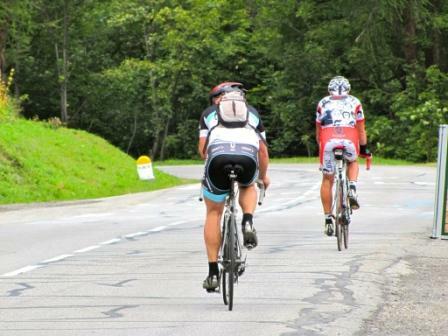 Here in Creuse they’re not so good – hoot, cut you up and haven’t a clue as to the law regarding cyclists’ rights sadly. I’ve blogged angrily about it many times! I’ll start looking for llama-suitable land down in Le Sud, Stephanie. I think you need to live where the drivers don’t run you off the road.